“Corniche”: along sea and city, Beirut 2004. By Amira Pierce. Sea and city: Beirut 2004. 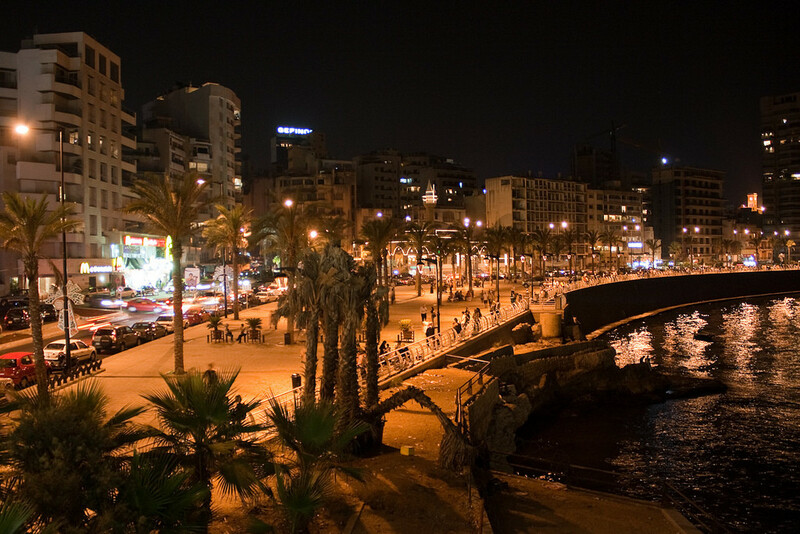 In a city with few public parks, the Corniche Beirut is a perfect gathering place, a seaside promenade open to everyone. 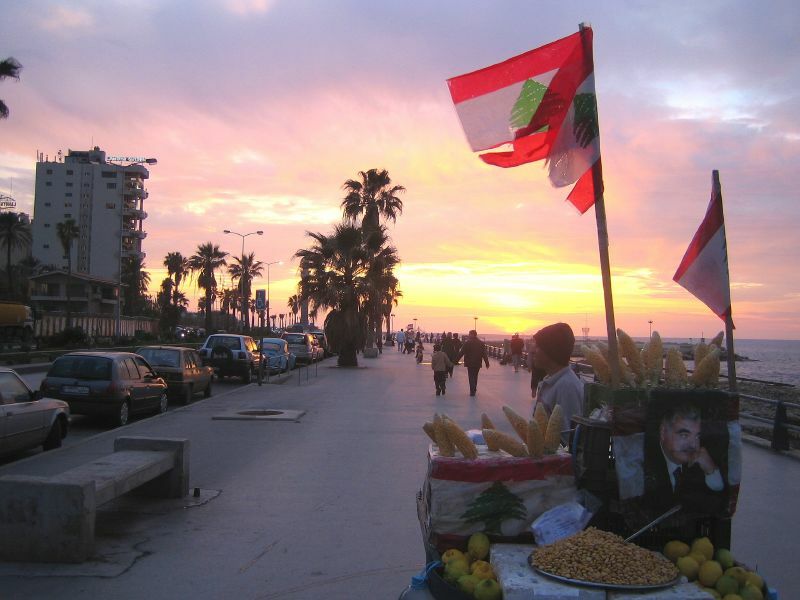 It’s where big luxury hotels meet everyday Lebanese, on broad walkways and dark rocks along the lapping Mediterranean. Today, as the sun sinks toward the water, my aunt Yousra finds a spot for her faded navy blue Volvo along the busiest part of the seaside stretch. We agree this is the best time here—the sky slowly coloring, the air cooling, the work day over. People rest on benches and along railings, kept company by the sad, squat palm trees that line the walkway made of large concrete slabs. Swimmers jump off the rocks below. Loungers bring lawn chairs to set up on the flat rocks and concrete juts where they play cards and smoke argileh. Hotels and fancy apartment buildings stare at us from across the busy street. The people inside them are lucky; they can always see the water, so close, from their windows. But we are lucky to be even closer. We smile at each other, look into the sun as it falls towards the sea. The glow across everything thaws some deep and usually frozen part of us. Taunte Yousra asks me how I feel about having left New York, having said good-bye to my job, my friends, my life. I can’t quite say; I don’t know what I’m looking for. I’ve been trying to write about it. “It is hard,” I say. I think of the hours today I spent staring at pages on the internet, chasing after news from home in emails from friends and on the New York Times website, and on Friendster. The screen moved achingly slowly on the dial-up connection here, and our feet move quickly now across the concrete walk. It’s my third night on the Corniche in the week I’ve been in Beirut. It’s been four years since my last visit. I’m trying to find a job here now, but it seems that would be easier in Cairo, where I have friends and life is cheap and it’s a lot easier to get around the rules about expat work. Here, in my mother’s tiny country, jobs are scarcer than ever, and work permits for foreigners are hard to get. And even though I was born here and have returned again and again throughout my life, I am considered a foreigner. The government is trying to pass a new law that will make it easier for someone like me to get a work permit, Aunt Yousra says. Under the new rules, I might even be able to get citizenship, but, knowing how government works, the paperwork is likely to take years. She sighs, changes the subject slightly: “I can find you a husband,” she says. I can’t tell if she’s serious. I pretend she isn’t. “Ha,” I say. I make eye contact with a small child who toddles across my path, her mother’s hand resting on her curls to guide her. “I’ll wait on the husband.” I try to fantasize but I can’t really see him. He’s a blur. His hair is dark, gelled. He needs to shave each day to keep his jaw smooth. Where does he work? His family business or some hip tech company? How does he treat women? Does he demand perfection? That his wife wear makeup and heels? Where do these images come from? Quite suddenly, a sense of movement, a sharp breeze. A bicycle. We’re nearly run over by a man shooting his bike in and out of the scores of people who have come out to enjoy the evening. Behind him, he has rigged a crate bulging with loaves of ka’ak, a Lebanese brown sesame bread that comes in a small loaf that looks like a purse and is often stuffed with a za’atar herb mix or cheese. He zooms past, his knee grazing mine. I nearly fall, but my aunt catches me. My breath gets all locked up in my throat, but Aunt Yousra stays cool. She explains that the cyclist must have been fleeing from the police since vending is prohibited on the promenade. I am surprised at this, remembering two nights ago, a weekend night, when my cousin—and Yousra’s nephew—Marwan and I walked down the same strip and witnessed relaxed men renting argilehs and selling everything from roasted corn and Turkish coffee to neon-lit necklaces and colorful balloons. Families and couples and groups of friends were picnicking and sitting and talking and walking and skating and riding along—none of them with any apparent worries or cares. A little farther on, Aunt Yousra and I and see another ka’ak cart, this one abandoned by its proprietor, with a gray-camouflage-clad policeman waiting calmly next to it. “It’s a raid,” my aunt says as she clucks her tongue and I wrinkle my brow. The officer’s uniform makes me think of Marwan again, a night last week when he drove me through the narrow winding streets of a Christian part of town, trying to get to Monot Street, known for its bars. Marwan grew up in Beirut but lives in San Francisco now, so he is no longer familiar with his native city’s twists—streets gnarled and layered over by years of various wars, streets exploded then bulldozed and rebuilt and now decaying again over decades. That night, he told me of old places where this store used to be, that bar; places that now shelter ghosts and rats. And he showed a strange hope in the new tunnels and bridges and buildings that are unknown to him. In the dimness of the car, as we listened to Sabah, he talked of coming back some day. He swore his unborn children would come here more than once a year (as I would, I had once thought), that they would all live here eventually. Other family members have shown us that it is hard to come back after leaving Lebanon and building a life abroad; the diaspora was bigger than the actual population, everyone knows that. We turned up a street and right away saw a big red arrow on a blue sign, realized it was zoned one-way in the opposite direction. Marwan jerked the car to a stop and began to reverse. But Marwan didn’t accept the invitation to disobey. I’m not sure if it was because of the America in him or the car he noticed coming towards us in the distance, but he managed to reverse back into the intersection and abide by the law. I kept my eyes on the policeman for as long as I could, watched his gleaming mouth—open in laughter, or was it astonishment?—until he got too far away to see. Eventually we found a bar called Monot and had some mediocre mojitos. Sitting on a precarious terrace in the finally-cool night air, Marwan complained about Lebanon, and I nodded along in agreement. “But I love it,” he said. “Yeah, it’s pretty great,” I said, “I missed it.” And my stomach felt full and warm. The mojitos were two for one. The second batch was tastier than the first. I pull a smile across my face. German? I’ve never gotten that before. A tiny pit bull—curiously harnessed but not exactly leashed—totters past us and makes me think of New York, where there are so many more of his kind. A man with a sweat stain in the shape of a heart in the middle of his T-shirted chest walks by. A pretty girl listening to headphones, her eyes nearly closed, weaves effortlessly in and out of the crowds on Rollerblades. Back in the Volvo, my Aunt Yousra plays Céline Dion—“For you,” she claims, then proceeds to sing along to every word. I’ve lived in Brooklyn, Virginia, Beirut, maybe Cairo soon. Home is nowhere; it can’t be everywhere. That’s how I felt when I was getting ready to leave New York, dreaming of my upcoming adventure but having trouble seeing myself wherever I might end up; packing my belongings with a feeling of emptiness in the face of this big decision I’d made to leave. And that’s how I feel now, thinking about the German words, the Canadian singer, the Mexican drinks, these Lebanese walks and drives, this Beirut night. But maybe I need to twist that thought, I think, as my aunt belts out her favorite line: “My heart will go on and oo-oon!” Her eyes sparkle at me as she slaps her fingers rhythmically against the dash. Yes, perhaps it’s truer that home is everywhere, and it can’t be nowhere, I think, as we turn off the Corniche road and away from the shimmering sea to wind our way past the hotels and up into our hilly neighborhood. My aunt’s singing turns to a hum and she rolls through every stop sign on the way home. Previous postTruth Teller Spotlight - Dr. Neal Hall Next postTruth Teller Spotlight: Lea Marshall, poet and dance critic.